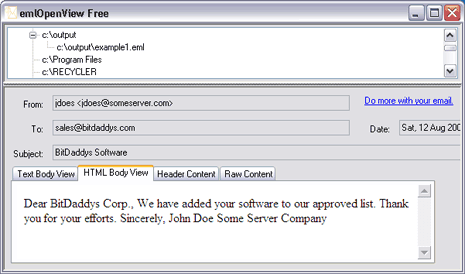 EML extension is used for email files saved by various email clients, servers and application software. EmailOpenView is a free program to open and view contents of an (RFC-822) EML email file. It has easy to use interface. To get started, browse and select EML file from a folder using explorer window at the top part of the application window. Lower part of application window will show email contents. You can view emails in different formats like: text body view, HTML body view, header content, raw content. It also supports command line option to open eml email files. Download EmailOpenView for easy viewing of EML files on the computer.